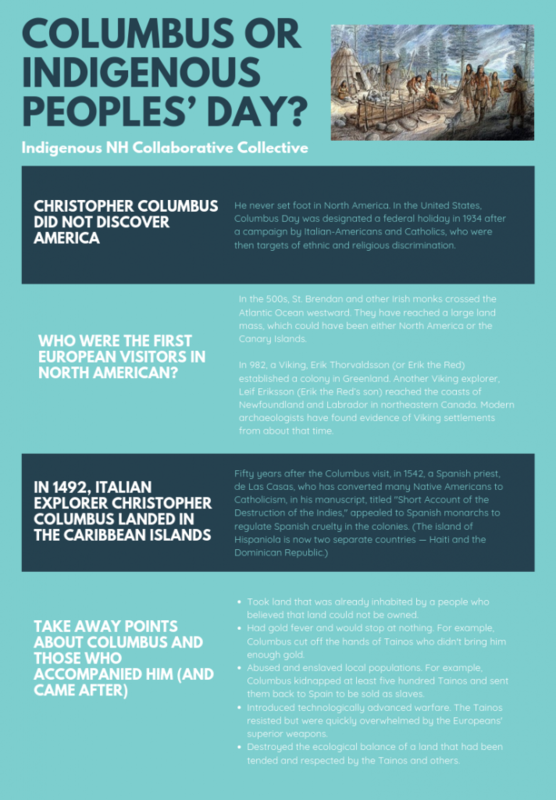 HB 221 is a bill currently in the New Hampshire House to rename Columbus Day as Indigenous People’s Day. Check the status of this bill on the NH General Court Website here. 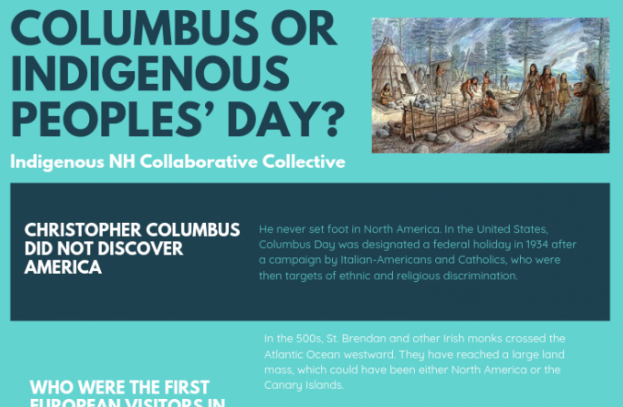 Why rename Columbus Day to Indigenous Peoples’ Day? Columbus or Indigenous Peoples’ Day? Christopher Columbus did not discover North America. He never set foot in North America. In the United States, Columbus Day was designated a federal holiday in 1934 after a campaign by Italian-Americans and Catholics, who were then targets of ethnic and religious discrimination. Who were the first European visitors in North American? In the 500s, St. Brendan and other Irish monks crossed the Atlantic Ocean westward. They have reached a large land mass, which could have been either North America or the Canary Islands. In 982, a Viking, Erik Thorvaldsson (or Erik the Red) established a colony in Greenland. Another Viking explorer, Leif Eriksson (Erik the Red’s son) reached the coasts of Newfoundland and Labrador in northeastern Canada. Modern archaeologists have found evidence of Viking settlements from about that time. How about Columbus and what happened soon after? In 1492, Italian explorer Christopher Columbus landed in the Caribbean islands. Yet into this land of the meek some Spaniards arrived who behaved like wild beasts, like starving wolves. During the past 40 years, Spaniards in the Indies have behaved in no other way. They are still killing, terrorizing and destroying the native peoples. Their cruelty has been extreme and relentless. Hispaniola once had a population of around 3 million, but now barely 200 natives remain… In 40 years, at least 12 million men, women and children have been killed for no reason, though, in truth, I believe the number is more like 15 million…. The Spaniards, with their horses and swords, began to carry out massacres and strange cruelties. They attacked the towns and spared no one, not only stabbing and dismembering the natives but cutting them to pieces as if dealing with sheep in the slaughterhouse. They wrapped others in straw and burned them alive…. The Spaniards forced their Indian slaves to work without rest and gave them little food. The men died in the mines and the women died on the ranches from the same exhaustion and hunger. The islands that had been so vibrant soon became nearly empty of people. Took land that was already inhabited by a people who believed that land could not be owned. Had gold fever and would stop at nothing. For example, Columbus cut off the hands of Tainos who didn’t bring him enough gold. Abused and enslaved local populations. For example, Columbus kidnapped at least five hundred Tainos and sent them back to Spain to be sold as slaves. Introduced technologically advanced warfare. The Tainos resisted but were quickly overwhelmed by the Europeans’ superior weapons. Destroyed the ecological balance of a land that had been tended and respected by the Tainos and others. The Indians who greeted Columbus were long believed to have died out. But a journalist’s search for their descendants turned up surprising results…. Columbus established the first American colony at La Isabela, on the north coast of Hispaniola, in 1494. After a brief period of coexistence, relations between the newcomers and natives deteriorated. Spaniards removed men from villages to work in gold mines and colonial plantations. This kept the Taíno from planting the crops that had fed them for centuries. They began to starve; many thousands fell prey to smallpox, measles and other European diseases for which they had no immunity; some committed suicide to avoid subjugation; hundreds fell in fighting with the Spaniards, while untold numbers fled to remote regions beyond colonial control. In time, many Taíno women married conquistadors, combining the genes of the New World and Old World to create a new mestizo population, which took on Creole characteristics with the arrival of African slaves in the 16th century. By 1514, barely two decades after first contact, an official survey showed that 40 percent of Spanish men had taken Indian wives. The unofficial number [was] undoubtedly higher…. In a week of exploring Baracoa and its environs [in 2000 C.E. ], we had encountered many Cubans with the high cheekbones, coppery skin, and other features that suggest Amerindian ancestry. And while it was clear that indigenous families have intermarried with Africans and Europeans, we met villagers in Baracoa and the nearby settlements of Playa Duaba and Guirito who proudly identified themselves as Indian. They kept the old traditions, planting their dense gardens, praying to the moon and sun for strength, gathering wild plants for healing, and marking the passage of time without clocks or watches.